The Supreme Court delivered a blow Thursday to President Obama, ruling that he went too far in making recess appointments to the National Labor Relations Board. In a unanimous decision, the high court sided with Senate Republicans and limited the president's power to fill high-level vacancies with temporary appointments. It was the first-ever Supreme Court test involving the long-standing practice of presidents naming appointees when the Senate is on break. In this case, Obama had argued that the Senate was on an extended holiday break when he filled slots at the NLRB in 2012. He argued the brief sessions it held every three days were a sham that was intended to prevent him from filling the seats. The justices rejected that argument, though, declaring the Senate was not actually in a formal recess when Obama acted during that three-day window. "Three days is too short a time to bring a recess within the scope of the Clause. 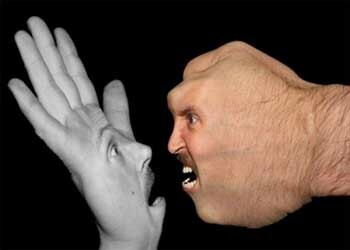 Thus we conclude that the President lacked the power to make the recess appointments here at issue," Breyer wrote. At the same time, the court upheld the general authority of the president to make recess appointments. Senate Republican Leader Mitch McConnell, among those who criticized the president for unilaterally filling the NLRB slots, applauded the high court decision on Thursday. "The president made an unprecedented power grab by placing political allies at a powerful federal agency while the Senate was meeting regularly and without even bothering to wait for its advice and consent," he said in a statement. "A unanimous Supreme Court has rejected this brazen power-grab." On a separate track, House Speaker John Boehner said a day earlier he plans to proceed with a lawsuit against the president over his alleged abuse of executive power. Reacting to the Supreme Court decision on Thursday, White House Press Secretary Josh Earnest said the administration is "deeply disappointed" in the ruling. He said that while the administration disagrees with the decision, it will honor it. The issue of recess appointments receded in importance after the Senate's Democratic majority changed the rules to make it harder for Republicans to block confirmation of most Obama appointees. But the ruling's impact may be keenly felt by the White House next year if Republicans capture control of the Senate in the November election. The potential importance of the ruling lies in the Senate's ability to block the confirmation of judges and the leaders of independent agencies like the NLRB. A federal law gives the president the power to appoint acting heads of Cabinet-level departments to keep the government running. Still, the outcome could have been worse for the administration. The justices, by a 5-4 vote, rejected a sweeping lower court ruling against the administration that would have made it virtually impossible for any future president to make recess appointments. The lower court held that the only recess recognized by the Constitution is the once-a-year break between sessions of Congress. It also said that only vacancies that arise in that recess could be filled. So the high court has left open the possibility that a president, with a compliant Congress, could make recess appointments in the future. The case decided Thursday arose out of a dispute between the NLRB and a Pepsi-Cola distributor, Noel Canning. The NLRB had ruled against him in a labor dispute, but Canning argued that three of the five board members were improperly appointed. A recess appointment can last no more than two years. Recess appointees who subsequently won Senate confirmation include Chief Justice Earl Warren and Justice William Brennan, Federal Reserve Chairman Alan Greenspan, two current NLRB members and Consumer Financial Protection Bureau director Richard Cordray. Former UN Ambassador John Bolton is among recess appointees who left office because they could not win a Senate vote. As Russia continues stepping up its propaganda war, the Putin regime continues to implausibly deny any responsibility for the civil war spawned in the eastern regions of Ukraine. Putin’s cynical denial of responsibility for his operatives’ actions in Crimea strained the imagination of even the most credulous observers; even Putin had to confess that the “little green men” were really his soldiers all along. By some accounts, Kazakhstan and Belarus, Russia’s partners in its new Eurasian Economic Union, may be looking for a way out before the union even goes into effect next year. Ukraine—with its steel mills, coal plants, bountiful agricultural resources, and massive population of 46 million people—has always, according to Russia experts, been key to Putin’s vision for the Eurasian Union. Why does Putin risk a war in Ukraine to build his Eurasian Union? Because he is implementing—in whole or in part—the Eurasianist doctrine which was developed by the man know as “Putin’s Brain:” Aleksandr Dugin (pictured, top). Dugin’s Foundations of Geopolitics helped reshape the views of Russia’s political and military elite in the late 1990s and gave a new form to old prejudices against the Western nations by means of the Eurasianist ideology. Putin appears to have given support to Dugin’s Eurasianism from the earliest days of his presidency: the Evraziia (Eurasian Movement) was organized in April 2001 as the "brainchild" of presidential counsel Gleb Pavlovsky. Eurasianism has not only found favor with the Putin regime: Gennady Zhuganov of the Communist Party of the Russian Federation and Vladimir Zhironovsky of the Liberal Democratic Party have both proclaimed their adherence to varying forms of Eurasianism, and Dugin is credited with having influenced both men. Eurasianism leaves intact many of the territorial goals of the old Soviet Union while updating the ideology for a world which has grown cold to Bolshevik boilerplate. Gone is the old Marxist-Leninist claptrap about the "class struggle" in favor of a global conflict rooted in “sacred geography” and an "inevitable" conflict between the continental might of Eurasia and the "sea power" of the United Kingdom and United States. What remains to be seen is how far Putin will go to implement Eurasianism. [F]or me and many other Latin-Americans, his undeniable literary achievement has been overshadowed by a moral failing: his long, intimate friendship with Fidel Castro and (far more important) his unflinching acceptance of the worst abuses of the Cuban regime. Gabo, as he was affectionately known, once wrote that “all dictators ... are victims” — which he may have really believed. It’s a sentiment one finds throughout “The Autumn of the Patriarch,” published in 1975, the year he began to firmly establish a personal link (which he had long desired) with Castro. When he finally did get a house in Cuba, García Márquez began to share culinary adventures with Castro. Fidel’s Cuban master chef named a lobster dish “Langosta a la Macondo” in honor of Gabo, its great enthusiast. When questioned about his closeness to Castro, García Márquez responded that, for him, friendship was a supreme value. That may well have been so, but there was certainly a hierarchy to his friendships — with Fidel at the top. In 1989, while García Márquez was living in his Cuban home, the murky trial of Gen. Arnaldo Ochoa and the brothers Tony and Patricio de la Guardia took place, resulting in death sentences for General Ochoa and Col. Tony de la Guardia, charged with drug trafficking and betraying the revolution. There was much opposition to the death sentence for General Ochoa, a hero of the Cuban victory in Angola over the invading army of the South African apartheid regime, and Colonel de la Guardia was a close personal friend of García Márquez. The colonel’s daughter Ileana, implored García Márquez to intercede with Castro to spare the life of her father. But he did nothing, and Ileana reported that he had even secretly attended a part of the trial, screened behind “a large mirror” in the company of Fidel and his brother Raúl. But if he actually did so, then why “in absolute silence”? He must have considered the imprisonments unjust. Instead of continuing to support a regime that committed such injustices, wouldn’t it have been far more valuable to issue a public denunciation and so help shut down Cuba’s political prisons? Prepara La Habana la salida de Maduro del poder? Recientemente hubo una reunión internacional en La Habana, en la que asistieron diversos mandatarios americanos. Faltó el presidente Martinelli de Panamá. No obstante estuvieron otros que hoy están con problemas económicos serios: Venezuela y Argentina. Estuvo el presidente de Uruguay, José Múgica quien fue preso político de la dictadura militar de su país y hoy es el dirigente político más sencillo, austero y claro de Iberoamérica. La prensa de izquierda iberoamericana le echa la culpa a las trasnacionales de la crisis argentina y protegen a la señora Fernández, al no aludir las malas decisiones de política económica de Buenos Aires. Fernández ha dejado la economía en un jovencito que está suprimiendo el bienestar del pueblo argentino, es en palabras de una colega mía de la Universidad Iberoamericana, “un pibe sin ideas”. Por su parte, Venezuela tiene el peor desempeño económico de América, precisamente porque el presidente de ese país, el señor Maduro no sabe gobernar ni tiene prestigio político, social, académico, intelectual, etcétera. Maduro fue nuevamente a La Habana a recibir órdenes de los hermanos Castro aferrados al poder desde hace 55 años. Venezuela es un satélite cubano. En La Habana, declararon al difunto Hugo Chávez como “humanista incansable”. ¿Cómo puede ser humanista un individuo que protegió a terroristas etarras, financió a los guerrilleros colombianos, escondió al super corrupto político Montesinos, brazo derecho del inolvidable demagogo, Fujimori? 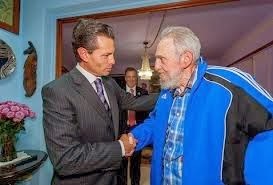 El presidente mexicano, Enrique Peña, quien tampoco es un estadista ni tiene logros políticos que puedan reconocerse, fue a Cuba para tratar de quedar bien con Raúl Castro. No les bastó a los cubanos la condonación de la deuda, quieren más, y el gobierno mexicano está dispuesto a dar más como lo hicieron los gobiernos de extracción priista, que protegieron a Castro frente a Estados Unidos una y otra vez, con una diplomacia falaz en la región. En un acto lamentable, Peña fue a visitar al semiretirado Fidel Castro, en un acto que es considerado de sumisión. ¿Por qué el gobierno mexicano le proporciona más balones de oxígeno al gobierno dictatorial cubano? ¿Qué valor puede haber en visitar a un gobernante que lucró con la venta de armas, de drogas (Pablo Escobar fue su socio), y que estuvo asociado a la Libia de Kadafi, a la Unión Soviética, y que actualmente tiene ligas con China y Corea del Norte? México pierde terreno internacional. Su asociación económica y política, arrastra al gobierno de Peña a un callejón sin salida. Si he criticado la intervención estadounidense en México, también critico que los Castro mantienen redes de espías en México. ¿Todavía los partidos mexicanos de izquierda le creen a Fidel, después de traicionarlos en 1988 cuando vino a bendecir el ascenso ilegítimo de Salinas de Gortari, que se siente dueño de México? Mañana, o mejor dicho en un futuro próximo, se comprobará que Fidel ordenó la muerte y desaparición de Camilo Cienfuegos, de que estuvo detrás del movimiento subversivo en Chiapas en 1994, que negoció drogas con un dictador panameño hoy preso y con carteles de drogas colombianos. ¿Cuánto dinero tienen invertido los hoteleros españoles y el magnate mexicano Slim en Cuba? Todos ellos contribuyen a fortalecer una dictadura corrupta, asesina, saqueadora y mentirosa. Cuando Fidel declaró hace años que su gobierno jamás ha torturado profirió la mayor mentira dicha en suelo cubano. El gobierno inexperto e ineficiente de México se involucra con una dictadura, y por tanto se negará a pronunciarse sobre la situación de los derechos humanos en la isla, porque supuestamente es un tema interno. Esto es falso, los derechos humanos están por encima de la soberanía de los Estados, más aún de las dictaduras. Venezuela está demostrando en estos días las diferencias entre la fuerza y la razón para alcanzar y mantener el poder. Parecía que Nicolás Maduro tenía todo a su favor para obtener una cómoda ventaja en las elecciones presidenciales del pasado 14 de abril. Aunque era más difícil perderlas que ganarlas, casi las pierde: la magra ventaja reconocida, después de perder cientos de miles de votos en pocas semanas, resulta ridícula. En el pasado artículo opinaba que Maduro obtendría un 11 % o más de ventaja, dadas todas las condiciones a su favor. No creí, aun sabiendo que él no era una lumbrera, que fuera tan torpe en una campaña política tan corta. De haber durado una semana más la contienda no hubiera podido robarle las elecciones a Capriles. ¿Qué tenemos ahora? La legitimidad de Maduro es dudosa, pero tiene el apoyo de muchos gobernantes latinoamericanos, y los que no lo apoyan tampoco lo condenan: cuando más, solicitan tímidamente un recuento de votos. El gobierno insiste en que el mismo domingo se auditó el 54 % de los votos, y que no hay que recontar más nada. Los países beneficiarios del chavismo no van a corregir a quien envía petróleo subsidiado. Los poderes estatales, que en una verdadera democracia son independientes, pero no en Venezuela, ungieron a Maduro como Presidente electo, y lo juramentarán el 19 de abril, ante la presencia de muchos gobernantes amigos. Tal vez Henrique Capriles, queriendo defender una victoria que siente que le han escamoteado, no se cuidó lo suficiente para no caer en una trampa: el martes tuvimos noticias de siete muertos y varias decenas de heridos durante manifestaciones de protesta, y de inmediato el oficialismo tildó a la oposición de “golpistas” y de provocar sangre y muerte de venezolanos. Con ello Nicolás Maduro, bajo el pretexto de proteger la paz y la democracia, prohibió tajantemente otras manifestaciones que se preparaban. Ahora se pretende inculpar judicialmente a Capriles y otros oposicionistas a causa de esas muertes, lo que podría llevar a serias condenas de cárcel en caso de ser considerados culpables, lo que en Venezuela no sería un problema si el gobierno así lo desea. Maduro tiene la fuerza, y la utiliza. Como no cuenta con un mandato ganado con una mayoría evidente, como aquellas que lograba Chávez —como quiera que lo hiciera— necesita reprimir. A nada le temen más los hermanos Castro que al pueblo en la calle protestando, y sus alumnos se saben bien la lección: los gases lacrimógenos se disuelven, las imágenes de las palizas se olvidan ante nuevas imágenes en los medios, y hasta los muertos van quedando cada vez más lejos en el recuerdo, pero un pueblo sublevado en las calles puede terminar linchando a Benito Mussolini o fusilando a Nicolae Caesescu, y ese riesgo no se puede correr. “Las calles de Venezuela pertenecen al pueblo”, dice el gobierno, nada original, repitiendo el slogan cubano. Capriles aspira a la legitimidad y la razón, pero no tiene la fuerza. Gritando, manoteando, no logrará nada. Ninguneó a Maduro durante la campaña, de quien no mencionaba su apellido: “Nicolás, no te vistas que no vas”. De la misma manera, Ramón Guillermo Aveledo, el secretario de la Mesa de Unidad Democrática, se refería al “encargado” como si fuera el conserje de un edificio, y no el Presidente encargado, el cargo oficial. Ahora “el autobusero”, con el apoyo de la maquinaria estatal y la fuerza de su lado, se siente invencible en el terreno de las bravuconerías y las trampas, y no le importa en lo más mínimo la razón que pueda tener su oponente, que de entrada canceló las marchas de protesta previstas y llamó a cacerolazos, ruidosos pero poco efectivos. El gobierno contraatacó diciendo que eso era lo que hacían los simpatizantes de Pinochet en Chile: por carácter transitivo, quienes protesten contra el gobierno en Venezuela son golpistas. A lo que le añaden que también son “fascistas”. Y en la Asamblea Nacional se despoja de sus cargos a los diputados que no reconocen a Maduro como Presidente. Capriles pide un diálogo con el gobierno para resolver la situación, pero no lo tendrá. Al diálogo llaman quienes pueden lograr algo por la fuerza pero por alguna razón les interesa evitar una confrontación: ese no es el caso de la oposición venezolana. Maduro no tiene interés en dialogar con una oposición a la que puede aplastar. Lo mismo que sucede en La Habana. No sería mala idea que Capriles buscara buenos abogados para enfrentar lo que se le prepara, o tal vez hasta una embajada amiga que le acoja, pues el gobierno lo acusará de instigador de la violencia y las muertes posteriores a las elecciones, de pretender desconocer la democracia y los resultados electorales. Ya Maduro lo dijo públicamente: “Usted señor amarillo se ha portado fuera del marco de la Constitución y la ley y tiene que responder ante la Constitución, ante la historia y ante la ley, porque usted es responsable de los muertos que hoy estamos velando… Usted es responsable de los muertos que hoy estamos velando, se lo digo yo, presidente de la República y usted tiene que responder por todo lo que hizo”. Ilustres venezolanos fueron antes a la cárcel o todavía están en ella por similares pretextos y causas. Sería injusto, pero Capriles podría pasar de candidato opositor a preso en poco tiempo, porque es un peligro para su gobierno. En Cuba sobran asesores “jurídicos” para que el gobierno chavista fabrique las acusaciones necesarias, aunque en 14 años de “revolución” ya en Caracas han aprendido bastante sobre el tema. Quienes contaban con la Fuerza Armada como garante de la democracia, divagaban. Los más altos mandos están comprometidos con el chavismo hasta el tuétano, y los mandos subordinados respetan demasiado la institucionalidad y temen ser considerados golpistas si intervienen de alguna manera para alterar el curso de los acontecimientos. Quienes aseguraban que la demora en dar los resultados la noche de las elecciones era porque los militares estaban “negociando” con el gobierno para que reconociera el triunfo de Capriles, una vez más demostraron su despiste. En el sur de La Florida y Madrid se ha dicho que hay preocupación en el gobierno cubano por la victoria pírrica de las elecciones. No es así. Hay desengaño, pues no pensaban que Nicolás Maduro pudiera ser tan bruto. Pero nada más. Para La Habana, como para Caracas, ya todo se enfoca como asunto concluido, una “trascendental” victoria que garantiza la “continuidad de la Revolución bolivariana” hasta el 2019. Y Raúl Castro “termina” en el 2018. Ya Maduro reiteró que “se seguirán fortaleciendo las relaciones con Cuba”. Business as usual. Hallacas y ron, Guantanamera y Alma Llanera, arepas y mojitos, todo mezclado. Mientras haya recursos para que no se acabe la fiesta. Complejo y difícil futuro para los venezolanos, con una crisis económica que ya tienen encima y una “dictadura constitucional” que se afianza, que acusa a Washington de cualquier cosa y alaba a La Habana por cualquier motivo. Es pura realpolitik: no importa que “los buenos” tengan la razón cuando “los malos” tienen la fuerza y el poder. but still some cubans guys are talking cuba will be a democratic country soon. 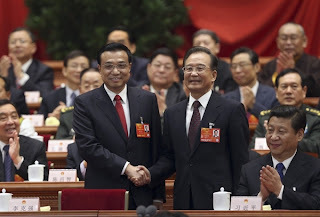 China's newly-elected Premier Li Keqiang (left) shakes hands with former Premier Wen Jiabao as China's President Xi Jinping, seated right, and other delegates applaud Friday. Li was once friends with democracy activists, but a dissident accused him of covering up an HIV scandal. BEIJING -- China's legislature formally chose Li Keqiang as premier on Friday, installing an English-speaking bureaucrat as the man in charge of the world's second-largest economy. The largely rubber-stamp National People's Congress chose Li, 57, to replace Wen Jiabao. Nearly 3,000 delegates gathered in Beijing's Great Hall of the People to vote on Li's appointment, putting the final stamp of approval on a generational transition of power. Li drew only three no votes and six abstentions from the carefully selected parliament. China's parliament named Xi Jinping as president four months after he took charge of the Communist party pledging reform. John Sparks, Channel Four Europe reports. He rose and shook hands with Xi Jinping, who was elected president by the legislature on Thursday, as legislators applauded. While Xi is the country's top leader, Li heads China's State Council and is charged with executing government policy and overseeing the economy. As premier, Li is faced with one of the world's widest gaps between rich and poor. "I believe that in this class (of new leaders), his intent to reform is quite strong," said Chen Ziming, an independent political commentator in Beijing. "He has a close relationship with reform-minded economists." More than any other Chinese party leader until now, Li was immersed in the intellectual and political ferment of the decade of reform under Deng Xiaoping, which ended in the 1989 Tiananmen Square protests that were crushed by troops. As a student at Peking University, Li befriended ardent pro-democracy advocates, some of whom later became outright challengers to party control. His friends included activists who went into exile after the June 1989 crackdown. "He has a better understanding of how Westerners think," a source familiar with China's foreign policy told Reuters. Li, who has a degree in law and a doctorate in economics, will take the reins of an economy whose growth slowed in 2012 to a 13-year low, albeit at a 7.8 percent rate that is the envy of other major economies. Both Xi and Li will need to deliver a blueprint to stabilize the real estate market. They need to do this quickly to calm a market in which real estate prices have soared 10-fold in major cities during the last decade. Across China, people are resentful of the widening income inequality gap. China has 2.7 million U.S. dollar millionaires and 251 billionaires, according to the Hurun Report. However, 13 percent of its people live on less than $1.25 per day, according to United Nations data. The average annual urban disposable income is just $3,500. During his time in central Henan province from 1998 to 2004, Li was criticized by activists for helping to cover up the extent of an HIV/AIDS crisis there, when hundreds of thousands of impoverished farmers became infected through botched blood-selling schemes. Leading dissidents, Hu Jia told Reuters he was detained in Henan, while Li was governor, for four days in 2002, when Hu was advocating for rural victims of AIDS. "When the AIDS epidemic exploded, everything that Li Keqiang did was with the aim of covering it up," Hu said. "He didn't allow the ordinary people to go to Beijing to petition, meet the media, and didn't allow Aizhixing, the institute I was working at, [to] enter Henan to examine and report on the reality of the AIDS situation." Hu said two state security officers beat and kicked him on Thursday till his head bled. He was summoned by police on a charge of "provoking quarrels and making trouble." The Dongcang police station, where Hu was held, could not be reached for comment. Cuba jugó fuerte en la gestión política de la enfermedad de Hugo Chávez y ahora está volcada en asegurarse de que el proceso electoral beneficia a Nicolás Maduro. Además del alrededor de 46.000 colaboradores cubanos que oficialmente viven en Venezuela, todos con la misión se garantizar la revolución chavista, La Habana está enviando un destacamento de agentes para el control electoral, que podría llegar a los 2.500 efectivos, de acuerdo con información de inteligencia salida de la isla. «Estamos aquí para ratificar nuestra entrega; si hasta ahora lo estábamos dando todo, ahora estamos dispuestos a dar hasta nuestras vidas, nuestra sangre si fuera preciso por esta revolución», proclamó la semana pasada Roberto López, jefe de las misiones cubanas en Venezuela, cuando una representación de estas rindió honores ante el cadáver de Chávez. De la continuidad del chavismo depende la pervivencia del régimen cubano. Los 100.000 barriles diarios de petróleo que Venezuela envía a su aliado suponen 3.700 millones de dólares al año. Cuba no los paga directamente, sino que básicamente devuelve el favor con sus 46.000 ciudadanos que en Venezuela oficialmente trabajan como médicos, maestros, preparadores físicos… Unos servicios que Caracas paga extrañamente caro. «Todo eso es una tapadera que esconde el control que Cuba tiene de Venezuela», asegura un anterior alto cargo de la estructura de poder chavista emigrado a Estados Unidos, que mantiene el anonimato para evitar represalias contra su familia. «El centro de operaciones de la inteligencia cubana, el G2, está en la sede que en Caracas tiene la agencia de noticias cubana Prensa Latina», denuncia. Esta persona indica que el control cubano es «absoluto», desde el mando en la expedición de los documentos nacionales de identidad a la gestión de los registros oficiales de todo tipo: de propiedad, mercantiles… «Todos los datos informatizados de los ciudadanos venezolanos se manejan desde Cuba», dice. Las dimensiones de esa supervisión foránea han sido apuntadas con frecuencia en los medios. «The Economist», por ejemplo, identificó hace dos años a Bárbara Castillo, exministra cubana, como alguien con un poder mayor que los propios ministros venezolanos, según testigos presenciales. «Los jefes cubanos son una estructura paralela a la que las propias autoridades venezolanas tienen que dar cuenta, también en el Ejército o la Judicatura», apunta la fuente antes mencionada, que corrobora el caso de Bárbara Castillo. También asegura tener conocimiento de la rendición de cuentas que el actual ministro de Defensa, Diego Molero, estuvo realizando ante instancias cubanas sobre militares afectos y desafectos en su anterior puesto como responsable de la «contrainteligencia de Miraflores» (el palacio presidencial). Agentes cubanos se han venido ocupando, además, de la función de guardaespaldas de las figuras institucionales más importantes del país, comenzando por el propio Hugo Chávez. Estos días se ha visto a su inseparable jefe de seguridad personal cubano desfilando junto al féretro. La cifra exacta de cubanos en Venezuela se ignora. En alguna ocasión La Habana ha hablado de 65.000 personas. La más reciente es la de 46.000, ofrecida en la Asamblea Nacional venezolana. Pero dado el secretismo de parte de sus operaciones es difícil dar crédito a cualquier número. El respetado escritor, historiador y exministro Simón Alberto Consalvi, fallecido el lunes, incluso llegó a hablar de 100.000. Su llegada comenzó a producirse a partir de la firma en octubre de 2000 del primero de los más de 150 acuerdos suscritos desde entonces entre Cuba y Venezuela, inaugurando lo que muchos han denominado como «Cubazuela». «Dos países, una sola nación», dijo Fidel Castro en 2005. «Con una sola bandera», añadió Chávez. Y Castro apostilló: «somos venecubanos». En abril de 2001 llegaron los primeros 6.000 médicos para el programa llamado Barrio Adentro, que hoy oficialmente alcanza los 30.000 efectivos. Se trata de la prestación sanitaria a las clases más populares venezolanas. Médicos, enfermeras y otro personal llegado de Cuba residen en esos mismos barrios. El control de datos personales en los ambulatorios y esa presencia capilar garantiza el control ideológico y electoral del grueso de los potenciales votantes del chavismo. «Nos sentimos doblemente comprometidos y hemos asumido esta triste eventualidad con mucha disciplina, con mucho deseo de seguir adelante apoyando al pueblo venezolano y en todos los procesos que se avecinan», declaró uno de los médicos a la cadena nacional TeleSur. Atrincherados tras la momia, los albaceas del chavismo comprobarán que la transmisión póstuma del carisma es un asunto muy complejo en cualquier otro país que no sea Corea del Norte. 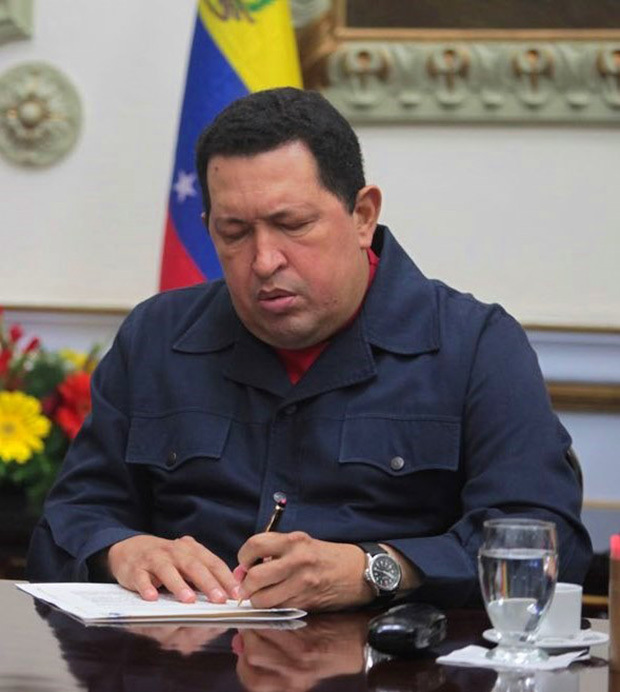 Nadie puede acusar al difunto Hugo Chávez ni a sus seguidores de haber ejercido la moderación y el buen gusto en los 14 años que duró la dictablanda boliburguesa del caudillo de Barinas, oficialmente denominada "socialismo del siglo XXI". Por eso la decisión de momificarlo y exhibirlo para la eternidad, tomada por sus herederos, resulta coherente con la trayectoria histriónica de una figura que soñaba con ser histórica. Por el momento, esta última dimensión todavía no está garantizada. Pero, en un plano más prosaico que el de la posteridad, sus secuaces albergan la esperanza de que el fiambre actúe como un talismán que mantenga vivo el recuerdo del héroe epónimo en las nuevas generaciones de venezolanas y venezolanos (como dicen ahora los progres), prójimos y prójimas (como decía Quevedo) que aportarán disciplinadamente su voto a los epígonos del difunto. Aunque ese efecto tampoco está asegurado, habida cuenta del estado general del país y la manera en que el equipo presidencial gestionó el óbito y el papeleo conexo. El secretismo, las verdades a medias y las mentiras enteras con que ocultaron la evolución de la dolencia del mandatario, su internamiento en un hospital de La Habana y el regreso clandestino a Caracas, las célebres fotos en las que aparecía sonrosado y sonriente, apenas unos días antes de fallecer, el silencio absoluto que Chávez guardó a partir del 11 de diciembre, los decretos que supuestamente firmó y los nombramientos que al parecer otorgó, las acusaciones de que el enemigo imperialista le había inoculado el cáncer: todo ese cúmulo de despropósitos apunta a una incapacidad palmaria de la jerarquía chavista para ponerse de acuerdo y afrontar la crisis con un mínimo de ecuanimidad y eficacia. Esa inepcia es incluso más notable porque se manifiesta a pesar de la presión en pro de la unidad que ejercen los hermanos Castro, principales interesados en que el poder se transmita sin sobresaltos para que el petróleo y los subsidios venezolanos sigan llegando a Cuba. La decisión de embalsamar el cadáver y exhibirlo como reliquia supera las cotas mundiales de kitsch alcanzadas previamente por Muamar el Gadafi, Sadam Husein y la prole de Kim Il Sung. 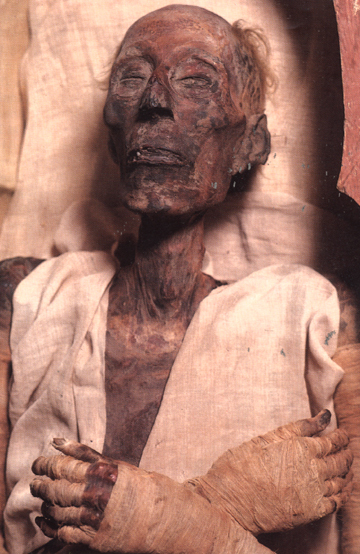 Pero aun atrincherados tras la momia, los albaceas del chavismo comprobarán muy pronto que la transmisión póstuma del carisma es un asunto muy complejo en cualquier país que no sea Corea del Norte. 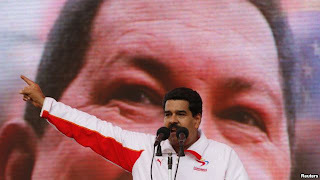 El presidente interino, Nicolás Maduro, parece convencido de que Chávez, como el Cid legendario, seguirá ganando batallas después de muerto. Quizá porque no ha leído a Thomas Paine, que ya en 1776 advertía: "la vanidad y presunción de gobernar más allá de la tumba es la más ridícula e insolente de las tiranías. El camino hacia Miraflores comenzó mucho tiempo atrás y fue tejido en las redes de influencia castrista que lo situaron desde un principio como el sucesor por excelencia del presidente Hugo Chávez. Este es el Nicolas Maduro que no todos conocen. Hijo de un militante de izquierda, Maduro, nació el 23 de noviembre de 1962 en el sur de Caracas. Durante sus años de estudiante de secundaria ingresó a la Liga Socialista, partido en el que inició su actividad política . A mediados de la década del 80 la Liga lo envió a La Habana, y durante un año cursó estudios en la escuela Ñico López de formación de cuadros del Partido Comunista de Cuba. Es durante esa etapa cuando conoce al dirigente cocalero boliviano Evo Morales, quien recibía cursos políticos en la capital cubana y que hoy integra como presidente de su país el grupo de países del ALBA. De regreso a Caracas, Maduro se destaca como dirigente estudiantil de grupos maoistas en la Universidad Central de Venezuela, y aunque no hay registros de su matrícula en esa Universidad, algunas fuentes aseguran que cursó dos años en la Escuela de Administración. Concluido su activismo político estudiantil, Maduro comienza a trabajar en 1988 como conductor de buses del Metro de Caracas, donde poco tiempo después organiza el Nuevo Sindicato del Metro de Caracas (Sitrameca). A principios de la década de los noventa, Maduro se unió al Movimiento Bolivariano Revolucionario (MBR-200), fundado en 1982 por Hugo Chávez Frías, poco antes del fallido golpe militar en 1992. Tras el arresto de Chávez y otros jefes militares implicados en el complot, Maduro, entonces, se enroló en una campaña por la liberación de los militares golpistas, liderada por su hoy esposa Cilia Flores, Procuradora General de la República, ex diputada y presidenta de la Asamblea Nacional . Fue a través de Cilia Flores, quien entonces era abogada de la Policía de Caracas, que Maduro conoció a Chávez y cuanto éste fue indultado en 1993 Maduro era miembro de la Dirección Nacional del MBR-200. En 1997, Maduro estuvo junto a Chávez en la fundación del Movimiento Quinta República (MVR), que un año después ganó las elecciones presidenciales. Elegido diputado de la Asamblea Constituyente de 1999, fue elegido diputado para la Asamblea Nacional en 2000 y reelecto en 2005, ocupando en ese período la presidencia del órgano legislativo venezolano. En el año 2006 Chávez lo nombró ministro de Relaciones Exteriores y el pasado año vicepresidente ejecutivo, cargo que le dejó el camino libre para acceder a la presidencia de la República, manejando los hilos del fraude institucional que le tejió meticulosamente La Habana. El testamento político de Hugo Chávez, escrito de puño y letra antes de su operación y llevado a Caracas por la presidenta argentina, Cristina Fernández de Kirchner, desencalló en el seno del chavismo el ascenso del vicepresidente Nicolás Maduro –y no Diosdado Cabello, presidente de la Asamblea Nacional, a quien constitucionalmente le correspondía– a la jefatura del país. Con las espadas en alto entre Maduro y Cabello en el día de la muerte de Chávez, sin que los partidarios de este en el Tribunal Supremo de Justicia (TSJ) quisieran facilitar una coronación del vicepresidente, la rápida llegada de Kirchner con el testamento acabó por desactivar cualquier oposición. Culminaba una orquestación en la que pocos dudan que Cuba ha llevado la batuta, acaparando el control sobre el moribundo Chávez. La presidenta llegó a Caracas el miércoles a primera hora y mantuvo varias reuniones, en un día en que toda la atención se centraba en el cortejo fúnebre por las calles de la capital venezolana. Fuentes informadas de los pormenores de esa visita han confirmado a ABC la existencia del testamento escrito, si bien no trasladaron detalles de su contenido, más allá de que el texto señalaba a Maduro como sucesor. Aunque Chávez había hecho esa designación también de palabra y públicamente el 8 de diciembre, antes de marchar a Cuba para su operación, el carácter testamentario del documento acabó por derrotar las aspiraciones de Cabello. Al presidente de la Asamblea Nacional, que internamente ha jugado la carta anticubana en su pulso contra el candidato refrendado por los hermanos Castro, el momento de la muerte de Chávez le pilló parcialmente fuera de juego. Si bien la defunción del presidente en La Habana se produjo sobre las 7 de la mañana del martes, como ya informó este diario, supuestamente Cabello no fue informado hasta que la noticia de un desenlace comenzó a ser trasladada a un círculo más amplio de dirigentes, a los que a media mañana se convocó a una reunión especial de la dirección política y militar del movimiento chavista (el anuncio oficial del fallecimiento no se haría hasta la tarde, dando una hora falsa). La coincidencia de la muerte y sepelio de la madre de Cabello acabó por desactivar su capacidad de reacción. La referencia a un testamento de Chávez y su posesión por parte de Kirchner fue algo avanzado en enero por el periodista venezolano Nelson Bocaranda, cuando al parecer la propia presidenta argentina comunicó a los Castro, durante su visita al centro médico en el que estaba internado Chávez, que tenía copia de dos cartas escritas por este en diciembre, antes de la operación. Kirchner mantiene una estrecha relación con la familia Chávez, especialmente con la hija mayor, Rosa Virginia. De hecho en su reciente viaje a Caracas durmió en La Casona, la residencia presidencial en la capital venezolana. Una vez cumplió su misión, Kirchner ya no se esperó al funeral del viernes. Quien entonces habría terminado por empujar la coronación Maduro fue Raúl Castro. Al menos su llegada a Caracas el jueves por la tarde coincidió con el despliegue de decisiones finales del TSJ y el aviso a los diputados de que al día siguiente, tras el funeral, la Asamblea Nacional tomaría juramento a Maduro. en familia, como corresponde. como en la finca de kubichelandia y en el imperio suche. Jorge Alberto Arreaza Monserrat2 es un internacionalista, profesor y político venezolano que ha ocupado diversos cargos de importancia en la Administración del presidente de Hugo Chávez y en la de su sucesor Nicolás Maduro. Desde el 9 de marzo de 2013 es el Vicepresidente de Venezuela3 cargo que se une al de Ministro de Ciencia y tecnología que ocupa desde 2011. En noviembre de 2005 asumió el cargo de presidente de Fundayacucho institución que otorga becas universitarias para estudiantes venezolanos. Esta casado desde 2007 con una de las hijas del fallecido presidente Chávez, Rosa Virginia Chávez con la que tiene un hijo, la conoció mientras estudiaba con ella en la Escuela de estudios internacionales de la misma Universidad. En enero de 2010 fue nombrado viceministerio de Desarrollo Científico y Tecnológico, el 27 de noviembre de 2011 asumio el cargo de Ministro de Ciencia y Tecnología. 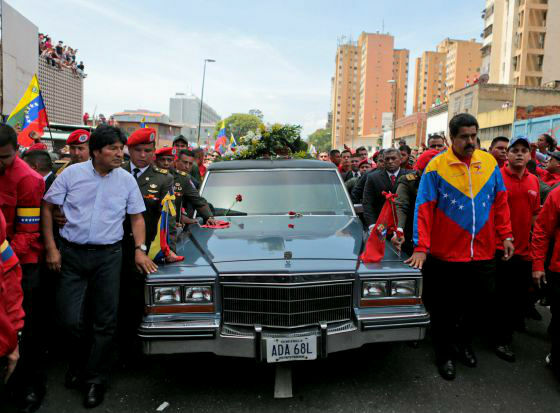 Tras la muerte de Chávez en marzo de 2013 el presidente encargado Nicolás Maduro lo designó Vicepresidente Ejecutivo de la República. Durante su gestión ha impulsado proyectos conocidos del gobierno venezolano como las computadoras canaimas en la educación primaria, el aprovechamiento de los satélites Miranda y Bolívar y la implementación de la televisión digital terrestre en Venezuela. La oposición ha criticado sus nombramientos debido al vinculo familiar que tiene con una de las hijas del presidente Chávez, sin embargo Arreaza también es primo hermano y ahijado del opositor Alberto Federico Ravell ex director de la cadena Globovisión y director del medio digital la Patilla. Jorge Alberto Arreaza Monserrat, de 39 años, fue nombrado como vicepresidente por el presidente encargado, Nicolás Maduro. Se desempeñaba como ministro de Ciencia y Tecnología. No sólo es uno de los más cercanos colaboradores y yerno del presidente Hugo Chávez, sino que por momentos, también se ha adueñó de su voz. Durante la convalecencia del Presidente en La Habana, el internacionalista de 39 años, dio la cara por su suegro y a través de las redes sociales y medios de comunicación, retransmitió mensajes y partes médicos del Jefe de Estado, aquejado de cáncer desde hace dos años y que falleció este 05 de marzo en Caracas. La cercanía entre ambos quedó evidenciada el 15 de febrero pasado. Ese día, los medios se encadenaron y aunque el ministro de Comunicación e Información, Ernesto Villegas, estaba presente durante la transmisión e hizo la presentación del espacio, el comisionado para mostrar las primeras y tan esperadas fotos del presidente Chávez en el hospital con sus dos hijas, las que le darían la vuelta al mundo, fue Arreaza. Él se ha encargado de describir la rutina presidencial. Fue quien advirtió que el Presidente "manda más que un dinamo". El 15 de febrero, en una entrevista en Telesur, contaba que han tenido varias jornadas de trabajo y que aunque el Jefe de Estado enfrenta dificultades para comunicarse, se hace entender. "Uno lo que tiene es que poner atención y él comunica perfectamente sus decisiones, cuando nos las escribe también, en algún momento él reflexiona, escribe algunas cosas, las comparte con nosotros". De naturaleza discreta, tranquila y comedida, Arreaza adquirió notoriedad pública luego de que se convirtiera en el yerno de Chávez, al casarse en 2007 con Rosa Virginia, su hija mayor. La unión entre ambos selló el inicio de su carrera política. Profesores que lo conocieron cuando cursaba la carrera de estudios internacionales en la Universidad Central de Venezuela, aseguran que nunca se destacó por su militancia o ideología. Más bien lo describen como un muchacho reservado aunque muy firme en sus argumentos, cualidad que luego le sirvió para llevar adelante el programa Diálogo abierto en Venezolana de Televisión. Arreaza dejó el espacio para escalar en la carrera burocrática. Su primer puesto la actual administración Chávez fue la presidencia de Fundayacucho (que asumió en noviembre de 2005), organismo creado durante el primer gobierno de Carlos Andrés Pérez para la capacitación del talento venezolano en el extranjero. De hecho, él se vio beneficiado por el programa de becas. Estudió una maestría de Estudios Políticos Europeos en Inglaterra. El 27 de noviembre de 2011 fue designado como ministro de Ciencia y Tecnología, cargo que ejerce hasta ser nombrado vicepresidente y que fue antecedido por su paso en el viceministerio de Desarrollo Científico y Tecnológico donde estuvo desde enero de 2010. Su nombramiento fue criticado por la oposición, porque no tendría las credenciales suficientes para estar frente de la cartera. El énfasis de su gestión ha estado en la producción y entrega de Canaimitas, en el manejo del Satélite Simón Bolívar y la Televisión Digital Abierta. Se describe a sí mismo, en su cuenta de Twitter, como "militante, socialista y bolivariano" y se refiere a su suegro como "comandante presidente". Por lo menos oficialmente, no hay espacio para sensiblerías. Sin embargo, en el álbum familiar que fue publicado por la cadena Univision, en varias gráficas aparece él junto a Chávez y una en particular, se le ve jugando tenis de mesa con el mandatario. Solo ellos dos. “Gracias infinitas por tanto amor al presidente Chávez. El pueblo siempre con su comandante, en todas las batallas”. Jorge Arreaza, ministro de Ciencia y Tecnología, escribió este tuit desde La Habana, ciudad que en el último año ha sido testigo de su ascenso meteórico dentro del oficialismo. Nadie duda de que el yerno de Hugo Chávez es el político emergente, el hombre más apegado al comandante revolucionario durante sus distintas convalecencias en Cuba desde junio de 2011. Y el más capacitado para, llegado el caso, transmitir su herencia política de los últimos meses. 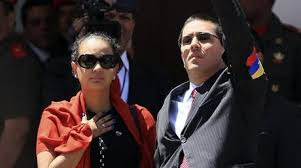 Arreaza y Chávez congeniaron desde su boda en 2007 con Rosa Virginia, la mayor de los cuatro hijos de Chávez. Así lo confirma la histórica fotografía en el Balcón del Pueblo, el 28 de julio de 2011, al regreso de Chávez de La Habana y cuando decidió cambiar el lema “Patria, socialismo y muerte” por “Para vivir viviendo”. En Venezuela el cáncer ha cambiado hasta las consignas políticas. Nadie imaginaba que el internacionalista Jorge Arreaza, conductor del programa de Venezolana de Televisión “Diálogo abierto”, acabara no sólo convertido en “hijo político” del presidente, sino en el líder de un grupo de jóvenes bien preparados de la Revolución. Hijo de diplomáticos, con postgrado en Europa, Arreaza nunca demostró convicciones marxistas en la Universidad. Al aterrizar en 2005 en Fundayacucho, organismo apreciado en la sociedad venezolana porque se dedica a conceder becas de estudios, el yerno del presidente insistió en no hacer proselitismo, tan habitual en otras instituciones del Gobierno. “Aquí cabemos todos”, llegó a plantarse frente a un militar que pretendía imponerle criterios partidistas. Con el tiempo, el joven internacionalista se fue rodeando de radicales de la Revolución y apartándose de los técnicos. En paralelo, Arreaza impartía clases de Estudios Internacionales. Y entre sus alumnos, una que destacaba: Rosa Virginia Chávez. Surgió el amor, el profesor abandonó a su anterior pareja y se casaron. Pronto nacería su hijo, al que el presidente desde muy pequeño bautizó como El Gallito. 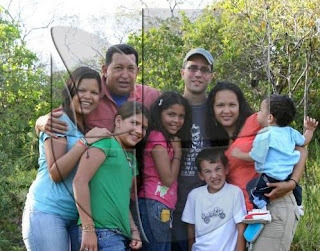 La meteórica carrera de Arreaza se disparó nada más aterrizar en la familia Chávez. Pronto fue nombrado viceministro, saltando a la titularidad de Ciencia y Tecnología en 2010. Contaba con la confianza total del presidente, que nunca dudó de su parentesco familiar con Alberto Federico Ravell, el exdirector de Globovisión. Arreaza fue conformando su círculo de poder, que al principio gravitó en torno a la figura del por aquel entonces vicepresidente Elías Jaua, el ala izquierda y universitaria del partido frente a la de Maduro, más sindicalista, y la militarista de Diosdado Cabello, a quien nunca se acercó. Otros ministros jóvenes, Andrés Izarra (hombre fuerte de TeleSur), Temir Porras y Luis Berrizbeitia (hijo de la historiadora Inés Quintero, alejada del credo chavista) fueron creciendo en liderazgo interno del chavismo hasta la primera crisis provocada por la dos operaciones realizadas a Chávez en junio de 2011. Hoy el ministro, encargado por el Consejo de Ministros para asistir al presidente enfermo, se ha convertido en su mano derecha en La Habana. 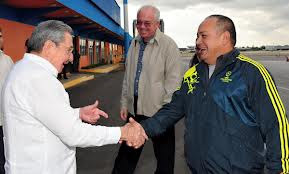 Y tan arriba ha llegado que participó en las negociaciones de la cúpula chavista para conformar la hoja de ruta del oficialismo, el conocido como Pacto de la Habana. De esos acuerdos salió reforzada la bicefalia Cabello/Maduro, con Arreaza posicionado muy cerca del vicepresidente; con Rafael Ramírez, presidente de PDVSA, aportando el músculo petrolero del Gobierno; y con el gobernador Adán Chávez, hermano mayor del mandatario, dando también el consentimiento familiar. La acción política de Arreaza ha continuado paralela a su desempeño como portavoz de la familia Chávez. “El comandante sigue batallando duro y le envía todo su amor a nuestro pueblo. ¡Constancia y paciencia!”, reclamó a principios de año a través de su twitter. Muy parecida a la que él mismo ha desarrollado en su escalada al poder. Caracas, 16 de julio de 2012 * La familia de mi novia, trilogía donde se relata la historia de un suegro que somete a su yerno a pruebas extravagantes para saber si se merece el corazón de su hija, se parece a esta historia. Pero además, en su última entrega, el nuevo reto es capacitar a su hijo político en las mismas responsabilidades, que como durante años tuvo como líder de familia. El film es una parodia cómica, mientras que este relato, es cosa seria. Algo que se ha demostrado en algunos regímenes de izquierda modernos, es el traspaso del poder a familiares. Estos gobiernos hereditarios han entregado la presidencia cuando se han visto incapacitados para continuar en el cargo. Tal es caso de la enfermedad de Fidel Castro y la asunción de su hermano Raúl en la dirección de Cuba y el reemplazo de Kim Jong-Il, por su inexperto hijo menor, Kim Jong-Un, en el manejo de una potencia nuclear como Corea del Norte. Manteniendo las distancias, pero recordando la admiración que siente el actual gobierno por el régimen implantado en la isla caribeña, tal sistema de transición, se podría reproducir. Hace más de un año de aquel discurso leído que estremeció a Venezuela, donde Hugo Rafael Chávez indicaba que se encontraba enfermo de cáncer. Luego de su supuesta recuperación total y un nuevo anuncio a principio de año, volvieron las dudas sobre si el Primer Mandatario podría llevar a cabo su campaña rumbo a la reelección, y aún más de su capacidad para mantenerse en frente a Miraflores. Muchos nombres han sido mencionados para suplantar al actual candidato y en alguna oportunidad, hasta en el mundo esotérico, se veía una mujer comandando en el país. La idea no pareció tan descabellada, ya que existía una candidata a primarias en la oposición. Quizás, alguna de las hijas de la familia Chávez, podría continuar con el proceso de su padre. Más aún cuando su hija mayor, Rosa Virginia, se ha desempeñando en los últimos años en las funciones destinadas para la Primera Dama. La difusión mediática de Rosa Virginia ha aumentado al acompañar y ayudar a su padre durante su recuperación. Lo que no se pensó es que podría ser su esposo, el yerno de Hugo Chávez. Aunque no se trata de un familiar consanguíneo, Jorge Arreaza es muy apreciado por el Presidente. No sólo se trata de su yerno, esposo de su hija Rosa Virginia, sino también una pieza clave en el gabinete ministerial. Jorge Alberto Arreaza Montserrat es un joven de 39 años quien estudió en la Universidad Central de Venezuela la carrera de Estudios Internacionales, donde conocería a su futura esposa. Luego de realizar una maestría en Estudios Políticos Europeos, se convirtió en docente de su casa de estudios donde imparte la cátedra “Europa”. También fue periodista en Venezolana de Televisión y compartió pantalla con la licenciada Vanessa Davies. Posteriormente en el año 2005 fue presidente de la Fundación Gran Mariscal de Ayacucho (Fundayacucho). Durante la década de los noventa, el veinteañero Jorge Alberto, cursó la maestría comentada en líneas anteriores, en el Reino Unido. Todo esto gracias a una beca que Fundayacucho le prestó en la llamada “Cuarta República”. En su momento frente a la institución, llegó a cuestionar los privilegios y destinos ofertados. Un importante ex ejecutivo del sistema de medios públicos, confesó algunas de las informaciones que tenía acerca de Jorge Alberto durante su paso por el canal del Estado. “Lo conocí después de los eventos de abril de 2002, cuando era ancla de VTV. Para ese momento, Jorge se había asociado con un personaje llamado Raúl. La asociación sería para monopolizar toda la publicidad oficial”. La fuente además informó que las ganancias de la sociedad debieron ser cuantiosas, debido a su producción, ya que eran realizadas en las instalaciones y con el equipo del canal 8. “Y aún así cobraban como agencia separada. Hoy en día Raúl es un adinerado boliburgues. En esa época, un periodista de VTV me dijo que Jorge salía con la hija mayor de Chávez, pero ya se conoce el final feliz de eso”. Jorge Alberto contrajo nupcias en el año 2007 con la hija del Presidente, luego de que ésta se divorciara de Pedro Pietro; con quien se casara en el Palacio de Miraflores. Del nuevo feliz matrimonio, nació un nuevo nieto para el líder de la revolución. Hoy día el pequeño tiene 5 añitos y fue bautizado por su abuelo como “El Gallito”. Posteriormente, en 2008, la acertada pareja fue vista paseando en la ciudad europea de Paris, junto a 10 guardaespaldas, rumbo a la residencia del embajador venezolano en Francia. Según la fuente, el comportamiento de Jorge Alberto dio un vuelco de 360 grados, luego de convertirse en el yerno de Hugo Chávez y en el actual ministro de Ciencias y Tecnología. Revela que se ha valido de su posición como familiar del Presidente para ejecutar exigencias y favores. “Él era un chamo delgado, respetuoso… pero ahora sólo con ser nombrado causa alboroto en su ministerio. Tanto es el miedo que le han agarrado, que dentro del mismo Partido Socialista Unido de Venezuela, sus opiniones han sido tomadas como mandatos”, indicó. Pero no sólo ser hijo político de un Presidente lo ha ayudado. También es hermano de Gustavo Arreaza, el Joaquín Riviera de la revolución, quien fue el autor de la letra y la música del himno del Partido Socialista Unido de Venezuela y demás espectáculos artísticos relacionados al gobierno. Sin embargo, la gran sorpresa se da al continuar revisando el árbol genealógico de Jorge Alberto, quien sería primo y además ahijado del ex Director de Globovisión y cabeza de LaPatilla.com, Alberto Federico Ravell Arreaza. De esta manera, dos figuras opuestas como Chávez y Ravell, en realidad son familia, por lo menos política. Durante varios de los viajes del Primer Mandatario a la isla de Cuba, para realizarse tratamientos por su enfermedad, siempre se vio acompañado por sus hijas y de vez en vez junto a Nicolás Maduro, Canciller de la República y Ministro de Exteriores. El retraimiento mediático que ha sufrido Arreaza durante los últimos años, hizo que su paso por La Habana, fuera casi desapercibido. Pero en varias de las alocuciones que Chávez haría desde la isla, Jorge sería mencionado o fotografiado tímidamente detrás del protagonista. Nuestro informante vinculado a Arreaza y al alto gobierno, explicó que Maduro fue prácticamente sustituido por su joven yerno, que “ha estado desempeñándose como asistente de Chávez y es una de las fuentes de asesoramiento más inmediatas que tiene”. Además manifestó que en las venideras elecciones, también están en juego las gobernaciones que el chavismo desea recuperar. Entre ellas la del estado Miranda. “(Elías) Jaua fue llamado a cubrir la vacante de candidato del Psuv por Miranda, para que pudiese ser sustituido de la Vicepresidencia en cualquier momento. Así se justifica su reemplazo. El nombre que más suena para este cargo es el de Jorge Alberto. No sólo así quedaría momentáneamente la presidencia en manos de un miembro directo de la familia Chávez, también se aseguraría un posible candidato con características similares al del actual contrincante, si por motivos de salud, Chávez no puede continuar con la campaña”. El Presidente Encargado aseguró que cumpliría el juramento "de continuar su camino, de continuar la Revolución, de echar para adelante la independencia y el socialismo bolivariano". Asimismo, anunció como primer acto oficial de Gobierno que el ministro de Ciencia y Tecnología, Jorge Arreaza, será el nuevo Vicepresidente Ejecutivo del país. Maduro informó igualmente que se comunicó con la presidenta del Consejo Nacional Electoral, Tibisay Lucena, para que convoque a elecciones presidenciales inmediatamente, tal como establece el Artículo 233 de la Constitución. En otro momento, destacó que "nada ni nadie nos quitará la independencia reconquistada por el líder de la Revolución Bolivariana, Hugo Chávez". "No hay imperio sobre la tierra que pueda tocar tierra venezolana más nunca en la historia de nuestra Patria", dijo, y resaltó que había conversado con la delegación enviada por el gobierno estadounidense, integrada por dos congresistas, "a quienes les dijimos que más temprano que tarde las elites imperialistas que gobiernan Estados Unidos tendrán que aprender a convivir con respeto absoluto con los pueblos insurrectos de la América meridional morena, latina y caribeña". Al respecto, afirmó que había llegado "la hora de América Latina y el Caribe para ser un poderoso bloque económico, político, social, respetado por el mundo, para defender nuestra soberanía". Maduro también recalcó la solidaridad que cultivó el Presidente Chávez con los pueblos del mundo y los desposeídos, "solamente superada —dijo— por la del pueblo cubano de Fidel Castro". En su discurso de investidura aseguró que en Venezuela "la columna central de la paz está en las fuerzas revolucionarias", por lo que exhortó al pueblo a no caer en las provocaciones de la derecha. "No se deje provocar nadie por la respuesta temprana, iracunda y fuera de base de algunos pequeños sectores que han salido hoy a enloquecerse, otra vez, en medio del dolor de la pérdida de nuestro Comandante Presidente, según AVN. Por otro lado, reiteró que la dirección político-militar del Gobierno Bolivariano garantizará la paz, la seguridad y la estabilidad política del pueblo venezolano. Exigió a los pequeños focos de desestabilizadores de la ultraderecha venezolana, respeto para el dolor del pueblo venezolano, y les recordó que "aquí hay un pueblo para que la Revolución continúe". Poco después del acto en la Asamblea Nacional, Maduro se juramentó como Presidente Encargado, y luego juramentó a Jorge Arreaza como Vicepresidente Ejecutivo frente al féretro del Presidente Chávez, en la Academia Militar de Caracas. Arreaza señaló: "no solo lo juro, camarada Nicolás presidente, lo juro como le juré al Comandante en sus últimos minutos y segundos de vida, que se fuera tranquilo porque nosotros culminaríamos la lucha de Simón Bolívar y que cuando se encontrara con él en esa dimensión, le dijera al Libertador que nosotros culminaremos su lucha". La Sala Constitucional del Tribunal Supremo de Justicia (TSJ) interpretó el contenido y alcance del Artículo 233 de la Constitución, e indicó que "ocurrido el supuesto de hecho de la muerte del Presidente de la República en funciones, el Vicepresidente Ejecutivo deviene Presidente Encargado y cesa en el ejercicio de su cargo anterior".En su condición de Presidente Encargado, ejerce todas las atribuciones constitucionales y legales como Jefe del Estado, Jefe de Gobierno y Comandante en Jefe de la Fuerza Armada Nacional Bolivariana. La sentencia del TSJ también establece que, verificada la falta absoluta indicada, debe convocarse a una elección universal, directa y secreta; el órgano electoral competente, siempre que se cumpla con los requisitos establecidos en la normativa electoral, puede admitir la postulación del Presidente Encargado. Ni carnaval ni terremoto: simplemente “realpolitik”. Con la muerte de Hugo Chávez se comenzaron a repetir en Miami y en mucha prensa internacional una serie de lugares comunes que no conducen a más nada que a la depresión y el fracaso: uno de los más recurridos, que en La Habana están muy nerviosos. Una de las escenas más lamentables en la noche del martes mostraba en la televisión en español en Miami a venezolanos bebiendo, con arepas, música y cantos, repitiendo continuamente ante las cámaras que no se alegraban por la muerte de un ser humano sino por la oportunidad que se abría para Venezuela. Esa última expresión la repitieron también algunos políticos del sur de La Florida. Con lo cual unos y otros mostraban, simultáneamente, hipocresía en las declaraciones y despiste político. Innumerables veces se ha repetido, refiriéndose a Hugo Chávez y sus sucesores, que el liderazgo y el carisma no se heredan, lo cual es absolutamente cierto. Sin embargo, derivar de esa premisa el fracaso garantizado de los sucesores es la perfección del sofisma: ¿quién dice que sin liderazgo y carisma no se puede gobernar un país controlando los principales mecanismos del poder? ¿Por qué no le preguntan a Raúl Castro? Lo más grave para los sucesores de Chávez no será carecer de liderazgo o carisma, sino carecer de dinero en las arcas del gobierno para continuar financiando el clientelismo político y las medidas populistas. Y si bien la situación económica venezolana no es la misma de algunos años atrás, y puede empeorar mucho más, hay que preguntarse si realmente las arcas del chavismo están tan vacías como se dice. Pretender analizar la Venezuela chavista como un país normal y abierto, como se ha querido hacer con Cuba, solamente lleva a confusión y enredo. La misma cantinela sobre carisma y liderazgo se repetía acerca de Cuba en 2006, cuando era evidente que la salud de Fidel Castro se deterioraba y Raúl Castro, aceleradamente, resucitaba el secretariado del partido comunista cubano y afinaba un conjunto de medidas para garantizar la sucesión. A partir del 31 de julio de ese año, cuando se anunció la enfermedad del Comandante y su alejamiento del poder “con carácter provisional”, se repitió hasta el aburrimiento lo que ya se venía diciendo, y se especuló con la imposibilidad de que el general pudiera mantener el timón de la nave sin grandes cataclismos. 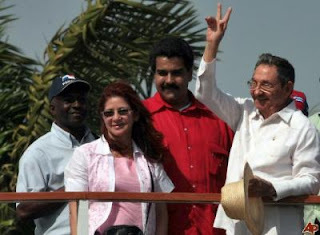 Sin embargo, en estos momentos, Raúl Castro, sin el liderazgo ni el carisma de su hermano mayor, llevaba ya seis años, siete meses y siete días en el poder absoluto (entre la etapa provisional y la oficial), sin dar muestras de que el control se le esté escapando de las manos, sino todo lo contrario. Ahora hay muchos que se preguntan qué estará pasando por la mente de los dirigentes cubanos en ocasión de la muerte de Chávez. Lo que esté pasando exactamente es imposible saberlo, pero lo que es seguro es que eso no los sorprendió, porque muchas variantes posibles ya estaban analizadas desde mucho antes. Nos pasamos el tiempo diciendo que los militares gobiernan en Cuba y controlan la economía cubana, lo cual es completamente cierto, pero después de decirlo consideramos que esos militares piensan y razonan como civiles tomando café en Hialeah o parejas de enamorados bebiendo cerveza en Varadero. Lo que menos gusta a los militares de cualquier país del mundo son las sorpresas: un militar sorprendido es un militar derrotado. Por eso viven continuamente “apreciando la situación” y analizando los escenarios posibles para cada contexto, así como las variantes de decisiones para cada caso. Con la salud de Hugo Chávez ha sido exactamente así: nadie conocía mejor que los gobernantes cubanos la naturaleza exacta de la salud del aliado bolivariano y los pronósticos sobre su enfermedad. Sin embargo, el eventual candidato opositor en unas elecciones que podrían celebrarse muy pronto, andaba por New York en viaje privado, visitando a su hermana: como ciudadano privado está en todo su derecho, pero como líder político podría pensarse si estaba en el lugar equivocado. Y mientras él viajaba, los militares cubanos y sus aliados en Caracas estaban listos para enfrentar y anunciar la muerte de Chávez en el momento que se produjera, y para ganar las próximas elecciones. Dije, e insisto, “en el momento en que se produjera” la muerte, porque han comenzado a circular rumores en el imaginario popular que señalan que Chávez habría muerto mucho antes, o que nunca habría llegado al Hospital Militar en Caracas porque seguía en La Habana, o que lo volvieron a llevar para Cuba, y muchas cosas más. Aun si eso pudiera probarse, ¿cómo cambiaría la situación para las elecciones? Demostrar que el gobierno venezolano no fue transparente o mintió no hará que los chavistas de a pie dejen de votar por el candidato del oficialismo, quienquiera que sea. Lo interesante es que mientras muchos se desgastan queriendo investigar sobre esos temas, haciendo declaraciones altisonantes, o razonando escolásticamente sobre las disposiciones sucesorias en la constitución venezolana, sin entender cómo funciona el poder, que no es exactamente como dicen las leyes, los herederos del chavismo ya habían comenzado desde mucho antes, asesorados por La Habana, a afianzar el proceso de endiosamiento del enfermo para aprovechar ampliamente la enorme ventaja emocional que tales situaciones generan. Y a engrasar y mover los mecanismos para aplastar a la oposición en las elecciones que deberán realizarse dentro de muy poco, donde todas las ventajas y las herramientas ocultas están a favor del chavismo, y donde no tiene sentido dudar que se producirá una aplastante “victoria popular”. Para lograr esa victoria, los siete días de duelo, que ya están corriendo, son decisivos. Y el resultado electoral tendrá, además, el aplauso de América Latina y el Caribe y la legitimación de los organismos internacionales. Sin embargo, con estas realidades por delante, hay quienes en Venezuela y en el exterior, Miami incluido, siguen hablando de las desavenencias entre “el autobusero” Nicolás Maduro y “el tenientico” Diosdado Cabello, dando por seguro el descalabro del bloque bolivariano en muy poco tiempo, debido a las discrepancias entre chavistas. Una vez más, dulce e inútil historia. ¿Serán las discrepancias Maduro-Cabello más fuertes, antiguas o profundas, que las de Raúl Castro y Ramiro Valdés en Cuba? Y ya hemos visto como se resolvieron esos problemas cuando, tras la enfermedad de Fidel Castro, se podía poner en peligro el poder si ellos se desgastaban en luchas intestinas, por lo que se lograron rápidamente los acomodos necesarios para que no se produjeran fracturas comprometedoras. Además, en el caso de Venezuela, son militares chavistas los que están ubicados en las principales posiciones de mando y control de tropas y en los servicios de seguridad, que es donde resulta fundamental estar para controlar los aparatos armados y el poder. Finalmente, el tema del petróleo se menciona continuamente para hablar del futuro de las relaciones con el Gobierno cubano. Digámoslo claramente: aun en el muy poco probable escenario de que la oposición ganara las elecciones presidenciales, no le sería posible cortar de golpe los suministros petroleros hacia Cuba. Un gobierno opositor que surgiera de esas elecciones tendría que lidiar con la realidad de alrededor de cuarenta mil “cooperantes” cubanos en todo el país, muchos de los cuales han pasado el servicio militar, saben manejar las armas, y como es costumbre en las misiones de colaboración cubana en el exterior, tienen su organización militar para situaciones de emergencia. Un eventual gobierno opositor en Venezuela no puede arriesgarse a choques de ese tipo. Maduro responde a La Habana, tanto como Cabello y todo el grupo duro de los chavistas, no por solidaridad abstracta, sino por necesidad: el principal mecanismo de sostén de los chavistas es el régimen cubano, con sus efectivas combinaciones de misiones sociales de gran arraigo popular en el país (salud, educación, deportes, cultura), sus eficientes servicios de inteligencia y contrainteligencia, sus mecanismos de propaganda, educación y “orientación revolucionaria”, su know-how dictatorial, sus asesores militares, y sus colaboradores-asesores en las más altas esferas del gobierno. Mientras haya recursos y condiciones políticas, el flujo petrolero de Venezuela hacia Cuba no amainará. Y si la crisis económica forzara a reducir los suministros subsidiados de hidrocarburos, hay muchos receptores de Petrocaribe a quienes comenzar a limitar antes de propinar recortes demoledores a La Habana. Si de todas formas hubiera que cortar, sería con tiempo suficiente para que Raúl Castro recomponga sus esquemas petroleros, lo que, por otra parte, viene haciendo desde que se conoció de la enfermedad de Hugo Chávez, e incluso antes, para no depender de un único suministrador. Los sucesores de Chávez no podrán mantener el mismo ritmo vertiginoso de la chequera bolivariana en el ALBA y tantos otros proyectos alocados creados por el ahora difunto líder, muchos de los cuales beneficiaban al Gobierno cubano. Se podrán ver recortes y limitaciones en los convenios y la ayuda hacia Cuba, pero eso no significa que se hagan de manera traumática ni que sucederá como cuando el desmerengamiento de la Unión Soviética: no tiene sentido para los chavistas debilitar a quienes les aseguran el poder. De manera que para el Gobierno cubano, la muerte de Hugo Chávez supone determinados ajustes, maniobras y selección de prioridades y opciones, pero no representa ni un carnaval ni un terremoto: simplemente, algo previsto en las alternativas de la realpolitik. Naturalmente, todos los proyectos sucesores anteriormente mencionados podrían fallar si en Venezuela surgiera una situación de ingobernabilidad que pusiera en peligro los mismos cimientos del poder chavista y sus protectores cubanos. Pero eso, sin un liderazgo opositor efectivo —que en estos momentos no parece capaz ni siquiera de organizarse y ponerse de acuerdo para definir una estrategia— queda en el campo de las quimeras. Así que algunos seguirán bailando, cantando y bebiendo, celebrando una supuesta oportunidad, y diciendo que lo hacen sin alegrarse de la muerte de un ser humano. Por su parte, quienes controlan el poder en Cuba y Venezuela seguirán ocupados en cosas mucho más importantes para ellos.